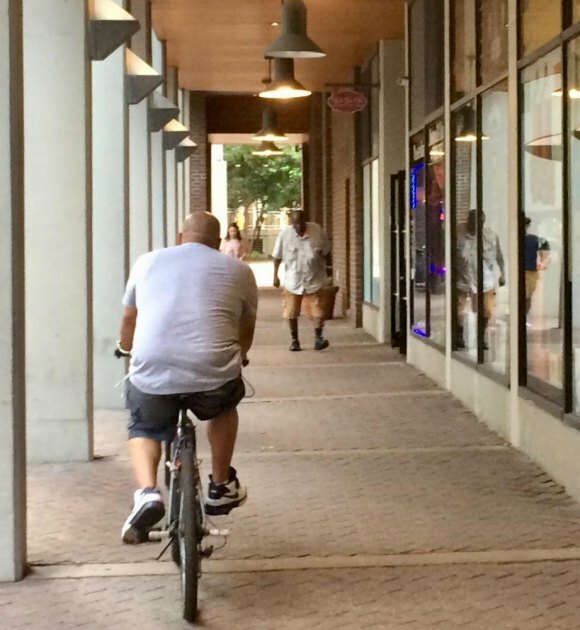 All too common, heedless bicycle riders challenge pedestrians on sidewalks. In June, Robert Krupka wondered, "...why the sign is there at the turn around on Main Street, if it’s not enforced? It was brought to my attention yesterday when I came within a foot of colliding with two bikes while crossing by Starbucks. The bikes were going against traffic and, of course, didn’t stop." An article in the New York Times today reminded to follow up. The signs are clear at the west roadway entrance near Southtown, but are often ignored. 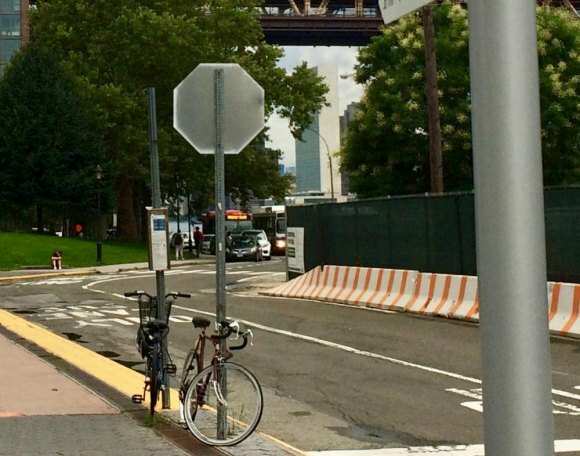 Not surprisingly, the subject of bicycle safety came to the attention of the Times only after East River Esplanade construction plans surfaced concerns from the well-to-do on Sutton Place. 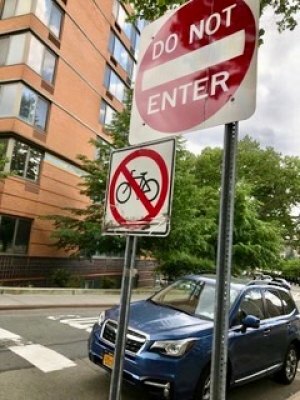 Many Manhattan neighborhoods, including Roosevelt Island, have seen increased disregard for the non-wheeled from bike riders without getting the featured treatment. By no means does this include all cyclists, nor even a majority, but a significant minority of delivery personnel and casual riders regard the rules like car drivers do in Naples - as suggestions or ideas that have a chance of catching on some day. One the first things I learned as a driver and a bicyclist is being aware of the right of way. Sidewalks were for walkers, off limits for cars and bikes. But just this past Sunday, my wife and I dodged a rider cruising down the sidewalk on Sixth Avenue near Central Park. The guy was actually ordering pedestrians to move aside as he coasted through. 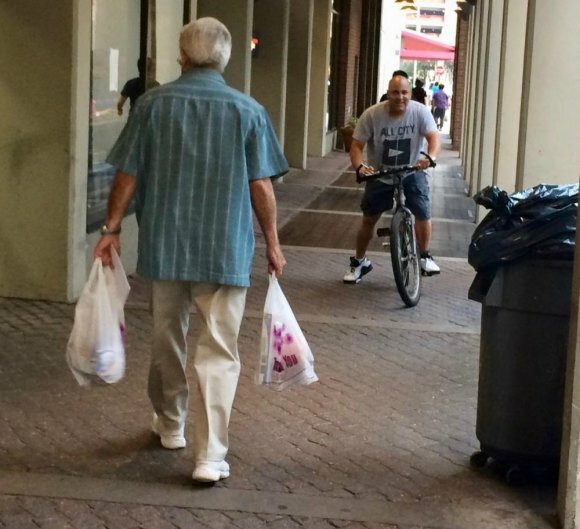 "You're on the sidewalk," I told him as he approached, hoping he'd temporarily lost his mind. "Got little ones with me," he explained, gesturing backward. Electric bike, illegal but ignored by PSD, stopped for a deliver in Manhattan Park after buzzing by me on the sidewalk. Sure enough, two children wobbled between pedestrians behind him. How did this make sense? What lingered with me was how he whisked away an increasingly common disregard for laws we all learned as if, as a cyclist, he had a right to waive them as he saw fit. I'd had a similar confrontation on Roosevelt Island, not long ago, startled to see an adult riding down the sidewalk in front of Westview. Park wherever you feel like it. Even when not in use, disregard for rules is flagrant. "Chill!" the genius responded when I spread out my arms, wordlessly gesturing: What the hell? Neither of these guys were kids, not even young adults. "What does amaze me," Krupka wrote later, "is that they zoom by Public Safety officers standing on Main Street with impunity. The officers are quick to confront U-turning cars but not the delivery bikes. The delivery electric bikes not stopping at stop signs or zooming down West Main with small children running about makes me cringe." 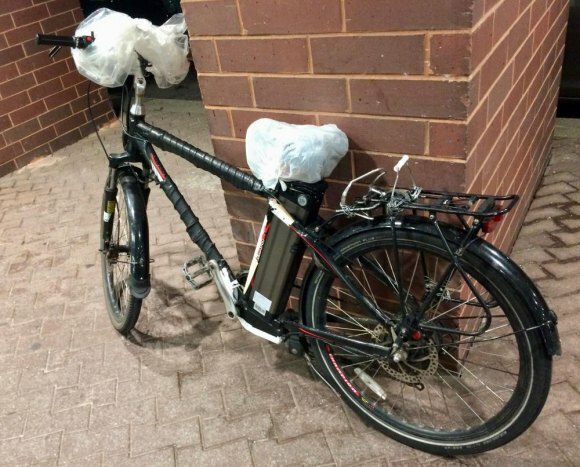 The electric bikes, illegal in New York State, meet little or no resistance from RIOC's Public Safety Department. “When you’re walking the street, and you’re trying to cross it, and there are bicycles coming all over the place, it’s a scary thing,” William Robertson told the Times. A parting shot, probably not the last you'll see. That goes for Roosevelt Island. A near total lack of enforcement is taken as license by some bike riders here as elsewhere. We've all seen it. What will it take to stop it?